Apple just released their diversity report, and many are saying there are no surprises, but I’m a little surprised. If you read the headlines only, you would think Apple and other tech companies are privileging white workers, but that is apparently not the case. Take a look at the chart I created below. The percentages of white people at these tech companies are less than the percentage of Whites in the US, which means they are not doing particularly well in the tech sector. Given that Whites in the US have natural advantages, even if they held the same US percentage, it would imply that they are underperforming. The biggest issue here is obviously the Asians. 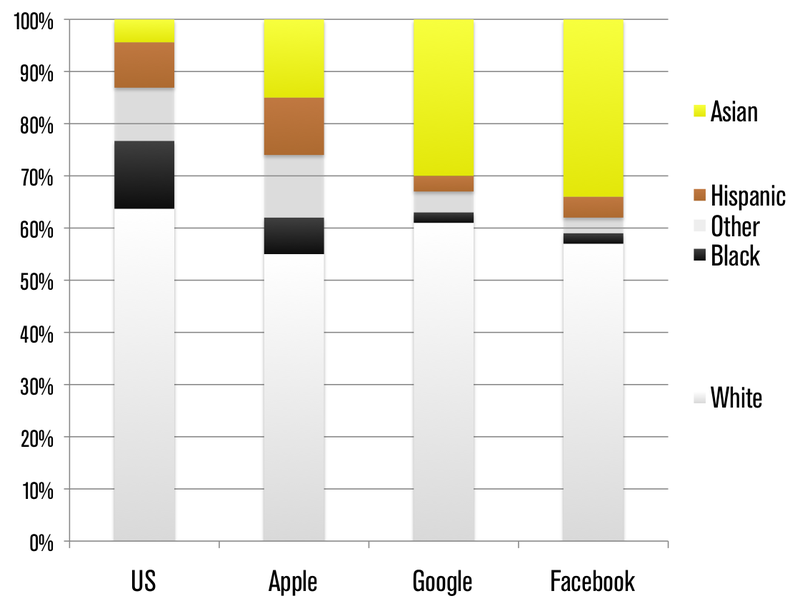 The race that accounts only for 4.4% of the US population is filling up 15% of Apple, 30% of Google, and 34% of Facebook. In other words, all the other races are being squeezed by Asians, not by Whites. Asian computer geeks are undervalued at home. Once salaries over in Asia catches up with salaries in the west (relatively soon) this trend will start to reverse. In 50 years or so when salaries are higher (by a good margin) in Asia than in the West (USA/Europe) and a majority of the “big” IT companies are located in Asia you will probably see the same statistics but with white and asian swapped. Secondly, (relatively) poor people are much more likely to choose an education that result in job opportunity rather than the education they “feel” like attending (i.e they will choose computer science over creative writing). You will simply have a lot more computer scientist per 1000 x graduates compared to the West. So, to summarize. Cheaper labor from a large(r) pool = High quality cheap labour = No reason not to hire from Asia. These statistics will self adjust quite soon I believe. (might take longer since Asia is most likely overproducing computer scientist at the moment, which oddly enough might mean that white people might eventually, once salaries become comparable, be overrepresented over in Asia in sectors were Asia is underproducing labour currently…). Also, minor point. All white people are not privileged. Poor white people are in fact underprivileged when it comes to education since there are no “programs” to adjust for their situation. I strongly agree with these two reasons for they really count most. But what he doesn’t suggest is a point that refers to the business region. As the human resource of these top tech co.s not only narrows in the employees within US, but has a structure all over the world. It’s because of their business strategy all over the world. So, along with the two crucial reasons as Andreas posts, the Asians take a higher percentage over those in US nation. Seen from this view, I thought the first column on the left is less appropriate than if replaced by a column reflecting the human resource structure throughout the world (not only those in US). Cause those top tech co.s are long being overseas corporations, to narrow the discusssion range might impossibly distort the way you testify and even the conclusion. Looking at just one variable like this is very bad statistics. You can’t really draw conclusions in this way, it’s almost worse than using no data at all. New/old ideas does not emerge from a void, but of course you are right, the above is at best classified as speculation on my part. @2001-2019 Dyske Suematsu, All Rights Reserved.